"I should see the garden far better," said Alice to herself, "if I could get to the top of that hill: and here's a path that leads straight to it  at least, no, it doesn't do that " (after going a few yards along the path, and turning several sharp corners), "but I suppose it will at last. But how curiously it twists! It's more like a corkscrew than a path!1 Well, this turn goes to the hill, I suppose  no, it doesn't! This goes straight back to the house! Well then, I'll try it the other way." "It's no use talking about it," Alice said, looking up at the house and pretending it was arguing with her. "I'm not going in again yet. I know I should have to get through the Looking-glass again  back into the old room  and there'd be an end of all my adventures!" "Oh, it's too bad!" she cried. "I never saw such a house for getting in the way! Never!" "We can talk,' said the Tiger-lily, "when there's anybody worth talking to." Alice was so astonished that she could not speak for a minute: it quite seemed to take her breath away. At length, as the Tiger-lily only went on waving about, she spoke again, in a timid voice  almost in a whisper. "And can all the flowers talk?" "As well as you can," said the Tiger-lily. "And a great deal louder." "It isn't manners for us to begin,3 you know," said the Rose, "and I really was wondering when you'd speak! Said I to myself, 'Her face has got some sense in it, though it's not a clever one!' Still, you're the right colour, and that goes a long way." "I don't care about the colour," the Tiger-lily remarked. "If only her petals curled up a little more, she'd be all right." Alice didn't like being criticised, so she began asking questions. "Aren't you sometimes frightened at being planted out here, with nobody to take care of you?" "There's the tree in the middle," said the Rose. "What else is it good for?" "But what could it do, if any danger came?" Alice asked. "It says 'Bough-wough! '"4 cried a Daisy. "That's why its branches are called boughs!" "Didn't you know that?" cried another Daisy, and here they all began shouting together, till the air seemed quite full of little shrill voices.5 "Silence, every one of you!" cried the Tiger-lily, waving itself passionately from side to side, and trembling with excitement. "They know I can't get at them!" it panted, bending its quivering head towards Alice, "or they wouldn't dare to do it!" "That's right!" said the Tiger-lily. "The daisies are worst of all. When one speaks, they all begin together, and it's enough to make one wither to hear the way they go on!" "In most gardens," the Tiger-lily said, "they make the beds too soft  so that the flowers are always asleep." This sounded a very good reason, and Alice was quite pleased to know it. "I never thought of that before!" she said. "I never saw anybody that looked stupider," a Violet said, so suddenly, that Alice quite jumped; for it hadn't spoken before. "Are there any more people in the garden besides me?" Alice said, not choosing to notice the Rose's last remark. "There's one other flower in the garden that can move about like you," said the Rose. "I wonder how you do it " ("You're always wondering," said the Tiger-lily), "but she's more bushy than you are." "Is she like me?" Alice asked eagerly, for the thought crossed her mind, "There's another little girl in the garden, somewhere!" "Well, she has the same awkward shape as you," the Rose said: "but she's redder  and her petals are shorter, I think." "They're done up close, like a dahlia," said the Tiger-lily: "not tumbled about, like yours." "But that's not your fault," the Rose added kindly. "You're beginning to fade, you know  and then one can't help one's petals getting a little untidy." Alice didn't like this idea at all: so, to change the subject, she asked "Does she ever come out here?" "I daresay you'll see her soon," said the Rose. "She's one of the kind that has none spikes, you know." "Where does she wear them?" Alice asked with some curiosity. "Why all round her head, of course," the Rose replied. "I was wondering you hadn't got some too. I thought it was the regular rule." Alice looked round eagerly, and found that it was the Red Queen. "She's grown a good deal!" was her first remark. 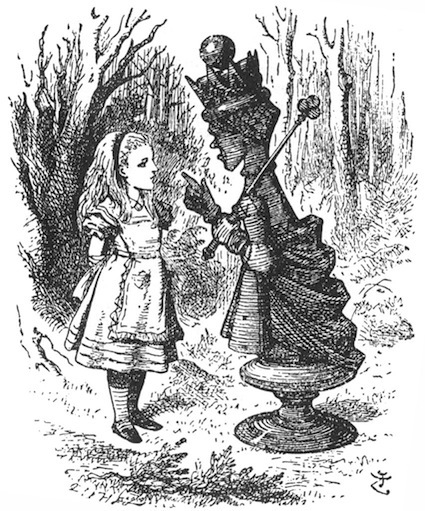 She had indeed: when Alice first found her in the ashes, she had been only three inches high  and here she was, half a head taller than Alice herself! "I think I'll go and meet her," said Alice, for, though the flowers were interesting enough, she felt that it would be far grander to have a talk with a real Queen. "You can't possibly do that," said the Rose: "I should advise you to walk the other way." This sounded nonsense to Alice, so she said nothing, but set off at once towards the Red Queen. To her surprise she lost sight of her in a moment, and found herself walking in at the front-door again. "Where do you come from?" said the Red Queen. "And where are you going? Look up, speak nicely, and don't twiddle your fingers all the time." "I don't know what you mean by your way," said the Queen: "all the ways about here belong to me10  but why did you come out here at all?" she added in a kinder tone. "Curtsey while you're thinking what to say, it saves time." Alice wondered a little at this, but she was too much in awe of the Queen to disbelieve it. "I'll try it when I go home," she thought to herself, "the next time I'm a little late for dinner." "It's time for you to answer now," the Queen said, looking at her watch: "open your mouth a little wider when you speak, and always say 'your Majesty.'" "I only wanted to see what the garden was like, your Majesty "
Alice didn't dare to argue the point, but went on: " and I thought I'd try and find my way to the top of that hill "
"When you say 'hill,'" the Queen interrupted, "I could show you hills, in comparison with which you'd call that a valley." 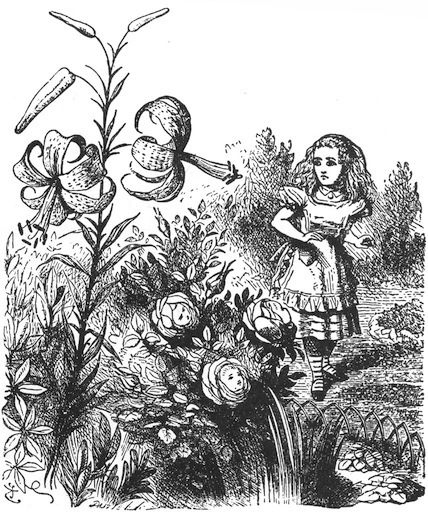 "No, I shouldn't," said Alice, surprised into contradicting her at last: "a hill can't be a valley, you know. That would be nonsense "
The Red Queen shook her head, "You may call it 'nonsense' if you like," she said, "but I've heard nonsense, compared with which that would be as sensible as a dictionary!" "I declare it's marked out just like a large chessboard!" Alice said at last. "There ought to be some men moving about somewhere  and so there are!" She added in a tone of delight, and her heart began to beat quick with excitement as she went on. "It's a great huge game of chess that's being played  all over the world  if this is the world at all, you know. Oh, what fun it is! How I wish I was one of them! I wouldn't mind being a Pawn, if only I might join  though of course I should like to be a Queen, best." She glanced rather shyly at the real Queen as she said this, but her companion only smiled pleasantly, and said "That's easily managed. You can be the White Queen's Pawn, if you like, as Lily's too young to play; and you're in the Second Square to begin with: when you get to the Eighth Square you'll be a Queen " Just at this moment, somehow or other, they began to run. Alice never could quite make out, in thinking it over afterwards, how it was that they began: all she remembers is, that they were running hand in hand, and the Queen went so fast that it was all she could do to keep up with her: and still the Queen kept crying "Faster! Faster! ", but Alice felt she could not go faster, though she had no breath left to say so. The most curious part of the thing was, that the trees and the other things round them never changed their places at all: however fast they went, they never seemed to pass anything. "I wonder if all the things move along with us?" thought poor puzzled Alice. And the Queen seemed to guess her thoughts, for she cried, "Faster! Don't try to talk!" Not that Alice had any idea of doing that. She felt as if she would never be able to talk again, she was getting so much out of breath: and still the Queen cried "Faster! Faster! ", and dragged her along. "Are we nearly there?" Alice managed to pant out at last. "Nearly there!" the Queen repeated. "Why, we passed it ten minutes ago! Faster!" And they ran on for a time in silence, with the wind whistling in Alice's ears, and almost blowing her hair off her head, she fancied. "Now! Now!" cried the Queen. "Faster! Faster!" And they went so fast that at last they seemed to skim through the air, hardly touching the ground with their feet, till suddenly, just as Alice was getting quite exhausted, they stopped, and she found herself sitting on the ground, breathless and giddy. The Queen propped her up against a tree, and said kindly, "You may rest a little now." "Of course it is," said the Queen. "what would you have it?" "Well, in our country," said Alice, still panting a little, "you'd generally get to somewhere else  if you ran very fast for a long time as we've been doing." "A slow sort of country!" said the Queen. "Now, here, you see, it takes all the running you can do,14 to keep in the same place. If you want to get somewhere else, you must run at least twice as fast as that!" "I'd rather not try, please!" said Alice. "I'm quite content to stay here  only I am so hot and thirsty!" Alice thought it would not be civil to say "No," though it wasn't at all what she wanted. So she took it, and ate it as well as she could: and it was very dry: and she thought she had never been so nearly choked in all her life. "While you're refreshing yourself," said the Queen, "I'll just take the measurements." And she took a ribbon out of her pocket, marked in inches,16 and began measuring the ground, and sticking little pegs in here and there. "At the end of two yards," she said, putting in a peg to mark the distance, "I shall give you your directions  have another biscuit?" "No, thank you," said Alice: "one's quite enough!" At the two-yard peg she faced round, and said "A pawn goes two squares in its first move,18 you know. So you'll go very quickly through the Third Square  by railway, I should think  and you'll find yourself in the Fourth Square in no time. Well, that square belongs to Tweedledum and Tweedledee  the Fifth is mostly water  the Sixth belongs to Humpty Dumpty  But you make no remark?" "I  I didn't know I had to make one  just then," Alice faltered out. "You should have said, 'It's extremely kind of you to tell me all this'  however, we'll suppose it said  the Seventh Square is all forest  however, one of the Knights will show you the way  and in the Eighth Square we shall be Queens together, and it's all feasting and fun!" Alice got up and curtseyed, and sat down again. At the next peg the Queen turned again, and this time she said, "Speak in French when you can't think of the English for a thing19  turn out your toes as you walk  and remember who you are20!" She did not wait for Alice to curtsey, this time, but walked on quickly to the next peg, where she turned for a moment to say "Good-bye," and then hurried on to the last. How it happened, Alice never knew, but exactly as she came to the last peg, she was gone. Whether she vanished into the air, or whether she ran quickly into the wood ("and she can run very fast!' thought Alice), there was no way of guessing, but she was gone, and Alice began to remember that she was a Pawn, and that it would soon be time for her to move. Considering that we are soon to learn that Alice is travelling on a chess board, and she has not yet been made a pawn, there is actually a logical explanation for her experience here, within the constraints of the Looking-glass world. (Though what I am about to write here doesn't have anything to say about the garden and how she eventually gets there.) The keys lie in chess on one hand, and the several sharp corners on the other. First, since Alice has not been designated as a chess piece yet, she can't move from the square she is currently on, so it actually sounds as if she is in effect walking around its edge. In some ways it is reminiscent of older computer games, where attempting to move outside of the current frame either resulted in you being turned at a right angle to head along the next edge of the screen, or you found yourself moving off one edge only to reappear at the opposite edge as if they were glued together. To a degree I have had an experience somewhat like this in real life, and many people trying to find their way around an unfamiliar town or campus may have had it as well. In those circumstances it can be surprisingly easy to end up walking in a circle and finding yourself back at what was your starting point when you began seeking your destination. Speaking only for myself, I eventually determined to work with this rather than against it, and started using it as a means of orienteering by locating and sorting out the street numbers and their directions and then getting that synched up with my map. After that it usually doesn't take long for me to get where I'm going. The biggest exception to this I have ever encountered was attempting to navigate my previous university's campus. In that case, there is a combination of visually deceiving factors in play. The campus is actually sited on a rolling patch of land that was reshaped by glaciation, so it includes a number of rounded hills known to geologists as drumlins. Accordingly, buildings may be on top of or cut into the drumlins depending on where they are sited. This allows one or more buildings to block different parts of their neighbours, and the rippled edges of the drumlins (rippled due to landscaping) hides significant portions of the walkways from view depending on your angle of sight. Add to that the fact that the buildings are a weird hodge-podge of architectural styles (most ugly), some connected, some not, some looking connected but actually not. This is quite an interesting conundrum. If you are not permitted to initiate a conversation with certain people, and those people don't expect you to be able to talk in the first place, starting a conversation with them is effectively impossible. Such rules are good, though not watertight social means of creating strong separation of social groups  as long as everyone subscribes to the rule. It seems quite strange that the tree can't talk, after all shouting "bough-wough" at danger and speaking otherwise are not mutually exclusive, especially in a land of strangeness. This is where Lewis Carroll fills in the majority of the "boorish character" compliment for this book. There is a delightful irony that the worst boors in the book after Humpty Dumpty are flowers, and not just any flowers but those most associated with sedate bouquets and button hole decorating. On a typographical note, I have been drawing assistance with the text entry here from a couple of different on-line texts of Through the Looking-glass, and have been most puzzled by the webpage (html) versions. The puzzlement isn't due to the text, which is quite straightforward of course, but due to the decision to render all of the italics from the original text into all-caps. Sometimes that might be the better option, especially here among the shouting flowers, but in general the practice is quite jarring because emphasis is not always equivalent to shouting. Meanwhile, anything typed in all-caps on-line is definitely shouting. 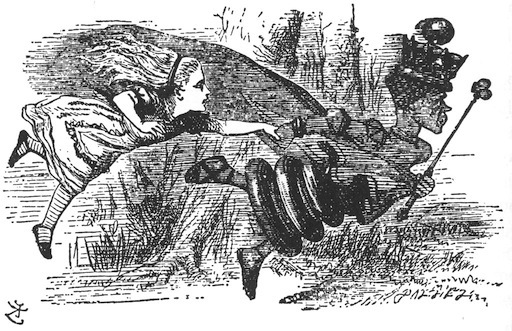 This description of the Red Queen's step together with Tenniel's illustration and the look of chess pieces leads the leader to expect her to come hopping along. As it turns out, that may be the slower speed of locomotion. At faster speeds the Queens move quite differently, as indeed the moves they are permitted in the real game would lead us to expect. It is a commonplace in Agatha Christie's mysteries that the hearty British throw windows open in almost all weathers to let good, fresh air in. Meanwhile Europeans like Hercule Poirot or elderly ladies like Miss Marple bundle up against drafts and damp. 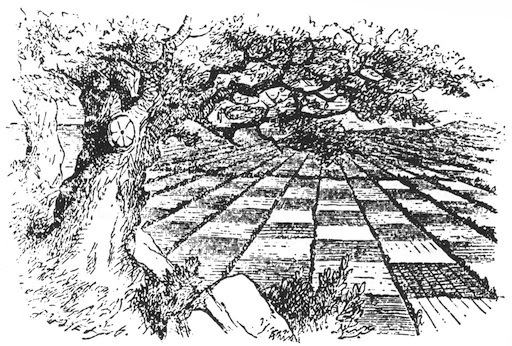 That is, Alice is on the Queen's side of the board, as can be verified in the Chess Problem illustration. This all about the Looking-glass effect, and there are also shades of the Duchess in Wonderland with her authoritative, universalizing statements. The image here is not quite so far-fetched as many others in Looking-glass land, though the closest real life version may be the prairie fields carved out of the interior of north america. There the divisions usually by barbed wire and rough rural roads arranged in a regular grid with periodic adjustment for the curvature of the earth. This regular gridding of fields is known in canada at least as the township and range system (a modernized synonym for "dominion land system" because canada is no longer referred to as a "dominion"), and has been imposed on most of the western provinces. There are those who claim the system is more rational than the alternatives, but you only need to see the absurdity of a fence line running through a pond to be struck by how strange that claim is. Specific parcels are designated by the number of township and ranges relative to a constant centre point, then section, then by legal subdivision. On top of that, the system was originally based on imperial units and canada has since gone metric, resulting in many oddball numbers that originally corresponded to whole numbers of "chains." A "chain" refers literally to the measuring chain used by the land surveyors wherever possible while setting up the original grid. For the physics-lovers out there, the Red Queen and Alice have been busy keeping up with particular reference frame, where in order to maintain a position unchanged relatively they had to move along with the reference frame. It is tempting to invoke the favourite parlour-magic trick of yanking a table cloth from under a place setting fast enough that the dishes remain in place. However, that isn't the same phenomenon. The place setting is held in place by inertia while the table cloth moves, whereas the implication is that someone has moved the chess board, and so the pieces must run to avoid falling off of it. Typically chess pieces aren't large enough or dense enough to be able to keep their place on the board by inertia or even friction alone. The italics seem misplaced here  they would seem to be better set on the verb rather than the pronoun. Shades of Wonderland again, where Alice's box of comfits served as the prizes after the caucus race, and proved too dry for some of the animals who received them. Such ribbons are seen rather less often these days, being better known in some places as measuring tapes. They find their main use in measuring and fitting clothes. The Red Queen's preparations do seem to have a relationship to the lines used to mark out the starting line for foot races. Behind the start line is usually a sort of box in which you can often see runners positioning themselves and doing their stretches and warm ups before the race starts at track and field events. When the call goes out for the runners to get "on their mark," they move to the top of the box just behind the start line. Unfortunately I can't find a clear description of the size or organization of these lines yet. It may well be that the boxes I am referring to are actually the staggered starting lines of the longer running races that account for the curvature of the track, versus the single starting line of the hundred metre dash. From what I understand, it isn't necessary for a pawn to move two squares at the first move in terms of rules. However, practically a pawn needs to move two squares right away to allow room for the pieces behind it to move, as the only piece that can jump other pieces is the knight. This bit of advice reflects the literal meaning of the french phrase brought into english for pretentious situations, "je ne sais quoi" which means literally "I don't know what." The phrase is a bit literary from what I have seen in my french readings. This advice might have been more helpful if the Red Queen had mentioned which square a person was most likely to suffer self-forgetfulness at.